As a coeliac I am well aware of how difficult to manage this condition can be and how unpleasant the symptoms are. My condition does not cause me any issues because I know how to deal with it but that may not be the case for you. And the information from mainstream medicine does not take all factors into consideration. If you choose to follow my approach you may well be surprised at the results you get. My aim here is to give you a clear picture of the condition and the best ways to protect and improve your health. If you like, it's an alternative view on coeliac disease and the aim is to help you achieve optimum health and a feeling of wellbeing. Some of the ideas may be new to you but stick with me and once you get the whole picture I think you may well agree with my approach. Symptoms include bloating, diarrhoea, nausea, wind, constipation, tiredness, headaches, sudden or unexpected weight loss (but not in all cases - some people put on weight and are unable to lose it - that's how it was for me), hair loss and anaemia. Dermatitis herpetiformis is the skin manisfestation of coeliac disease. Gluten is a protein which is found in wheat (including spelt), oats, barley and rye. People with coeliac disease are unable to tolerate this protein. Gluten consists of two proteins: gliadin and glutenin. It is the gliadin part to which people react negatively. When flour is mixed with water, gluten forms a sticky cross-linked network of proteins, giving elasticity to dough and allowing bread to rise when baked. How Does Gluten Affect Coeliacs? When gluten reaches the digestive tract your immune system mistakes the gluten for a foreign invader, like a bacteria. This causes your immune system to attack the invader but also an enzyme in the cells of the digestive tract called tissue transglutaminase. Exposure to gluten causes the immune system to attack the gluten and the intestinal wall which is why coeliac disease is classified as an autoimmune condition. The immune reaction can cause damage to the intestinal wall, eroding the villi (tiny finger like protusions in the intestinal wall which facilitate absorption) which leads to nutrient deficiencies, various digestive issues, aneamia, fatigue, failure to thrive as well as an increased risk of many serious diseases. Coeliac disease is believed to afflict about 1% of people, but it may be more common (over 2%) in the elderly. And it is possible that it is much more widespread. There are also studies showing that the rate of coeliac disease is increasing rapidly and there is wide speculation as to why this is happening. Personally I think it is related to intensive farming methods and the modification of wheat in addition to people just eating far too much wheat (if you are trying to avoid wheat you will have already realised it is an ingredient is most manufactured foods) In the past people .did not consume anywhere near the amount of wheat people do now. Keep in mind that a large percentage of coeliacs don’t even have abdominal symptoms, making diagnosis on clinical grounds very difficult. Coeliac disease can be difficult to diagnose and is often mistakenly diagnosed as IBS or as being stress related. The NHS generally start with a blood test looking for antibodies usually associated with coeliac disease. It is possible however to have the condition without having the antibodies in the blood stream so the test is not reliable. You can also buy kits on line and do the test yourself however the same applies and the tests cannot be relied upon (even thought their marketing claims otherwise). A biopsy is by far the most relable method of diagnosing the condition and is done with an endoscopy. One of the difficulties with this option however is your doctor has to have thought of coeliac disease in the first place and it can often be difficult to convince them that it is a possibility. The most common symptom of coeliac disease is diarrhoea, It is a message from your body that it needs to evacuate what you have consumed and quickly. Malabsorption can lead to stools containing abnormally high levels of fat (steatorrhoea). This can make them foul smelling, greasy and frothy. They may also be difficult to flush down the toilet. chronic constipation (not widely recognised by mainstream medicine. As well as being a coeliac, by American standards I also have an underactive thyroid. I have noticed in the past that when my thyroid is not supported and I eat wheat it mkes me constipated. I originally thought this meant my coeliac disease had gone (foolishly) but once my thyroid was back on form my usual response to wheat returned). There are also other symptoms which come about as a result of malabsorption or which simply go hand in hand with coeliac disease which are not generally considered. Thyroid problems - coeliacs are four times more likely to develop thyroid problems. There is wide debate as to thy this occurs but perhaps it is also connected to malabsorption. Yeast problems - yeast overgrowth is linked to thyroid problems and is common in coeliacs. It is most likely as a result of the disruption to bowel bacteria caused by chronic diarrhoea. Other food sensitivities - I have rarely found a coeliac who does not have multiple food sensitivities. This is most likely caused by the damage to the intestines. I have several sensitivities which cause me enormous health issues if I inadvertently encounter the foods. Corn, in any form, is my nemesis and rapidly causes inflamation in my joints. As I am also hyper mobile (double jointed was what it used to be called) it becomes very easy to dislocate my joints. Depression and anxiety can result from bowel disruption. I will address this issue later when looking at tactics for restoring and supporting your health. If not then I recommend, if you suspect you may be coeliac, that you try eliminating the foods anyway. If you feel better and your symptoms resolve then what difference does the label make? The standard advice is to avoid wheat, oats, barley and rye. And if you have already started to avoid these items then you will know that almost everything manufactured will have at leadt one of these ingredients. The best advice I can give you is to eat a natural human diet. That does not mean it has to be boring. You have all meat, fish, eggs, vegetables, fruits, nuts and seeds to choose from. In addition there is now a much greater variety of alternative grains and flours to choose from. * There is some debate about oats. They are apparently inherently gluten free (only when stated, often the crops are contaminated) however I find I cannot tolerate them. Best to try and see how you go with them but make sure you buy gluten free oats. Wheat and the other gluten grains are ingredients in lots of manufactured foods which is what makes it difficult to avoid. Below is a list that will help you to identify where these items may be hiding including the obvious ones. It's amazing where wheat can turn up. If there is any doubt about ingredients then I recommend not eating the food. The One Thing I Miss Most - Bread! Without a doubt, bread is the thing I miss most. I have tried many gluten free recipes for bread but until recently none were really totally satisfactory and not worth the effort. That is until I discovered a recipe on Pinterest that I was able to amend to suit my needs. It is easy to make, freezes well and makes good toast. I have yet to find a suitable container to make it in a size that would render it useful for sandwiches. Give it a try. Not only is it delicious it is really easy to make and almost impossible to go wrong. In a large mixing bowl combine all the dry ingredients and mix well. Whisk the maple syrup (just add the grated apple to the dry ingredients and mix well if you are choosing this option), melted extra virgin coconut oil and water together. Add the liquid to the dry ingredients and mix very well until all the ingredients are wet and form a thick dough. if the dough is too thick to stir then add a little more water. i find it easier to mix with my hands. Place the dough in a flexible silicon loaf pan and smooth the top with a spoon. 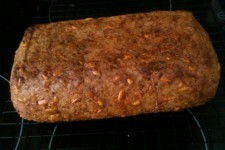 You could add some seeds to the bottom of the pan and they will end u on top of the loaf. Leave it to stand on your counter top for a minimum of two hours or all day or night. It should retain it's shape when you pull the sides of the loaf pan away. Preheat the oven to 350 F/175 C. Place loaf in the oven on the middle rack and bake for 20 minutes. Remove bread from the loaf pan and place it directly on the rack and bake for a further 30 - 40 minutes. The loaf is ready when it sounds hollow when tapped. Let the loaf cool completely before slicing (difficult but very important). Store in an airtight container for up to five days. Slice it up before freezing for convenient toast. Enjoy! I tend to share any wheat free information on my Google+ page and am intending to add a cauliflower pizza base really soon co check regularly. As I have already mentioned earlier, not only do I have coeliac disease, I also have a raft of other sensitivites too. I have found in my work doing food sensitivity tests that it appears to be rare for coeliacs to be just sensitive to gluten. It is common for coeliacs to also not cope with dairy well, to be sensitive to alcohol (when there is no wheat or barley content) and a host of other common sensitivities. If yo have been diagnosed as being a coeliac, or suspect that you may be, and have tried cutting wheat, oats, barley and rye from your diet but still dont' feel 100% then consider having a food sensitivity test. I understand that discovering there are other foods you should remove from your diet can be quite unappealing. If however you finally atttain a feeling of robust good health, have more energy and are less prone to picking up everything that's going around then it becomes much more attractive. I encourage people to explore with food and create a wealth of variety from a range of really nutritious foods. A coeliac diet does not need to be boring even if you have to eliminate other foods, I am also vegetarian and I still don't find it difficult to eat well with much more variety than anyone else I know. As a coeliac, if you want to feel really well, it is important to eliminate everything that may be affecting your ability to absorb maximum nutrients from the food you are consuming. It is important for coeliacs to consume a diet which is high in nutrietns to make up for any inability to absorb, Many of the alternative foods which you can get on prescription once you have been diganosed are nothing short of junk. But what you eat is not the only important issue to consider. Optimising your abiliity to digest foods and support your gut to absorb as much as possible is of primary importance. And restoring your bowel bacteria of of paramount importance. Low stomach acid is way more common than having too much stomach acid but is rarely even considered by mainstream medicine. You can easily test if your stomach acid is on the low side. First thing in the morning before you eat or drink anything put a heaped teaspoon of bicarbonate of soda into a small glass of water, stir briskly and drink. If you have enough stomach acid you will start to burp a lot within 5 minutes. If five minutes passes and there is no burping then it is highly likely you have low stomach acid. Dehydration is a very common cause of poor digestion. The first stage of digestion is known as the cephalic stage. Imagine that you are cooking some bacon. it's sizzling in the pan and you can smell the aroma. Your mouth starts to water and at the same time your stomach is flooding itself with gastric juices in anticipation of the meal. If you are chronically dehydrated then there is nothing to flood your stomach with. Water is also used in all the stages of digestion. You need 35mls of fresh, clean water per kg of body weight plus an additional half a litre to repay your hydration debt if you have not been drinking enough. It can take a year to be fully hydrated on a cellular basis. If you would like to know more about dehydration and its effect on your body then please read that section on my blog Youth Health and Vitality. 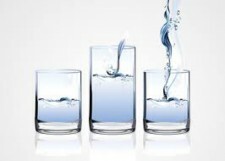 Start the day with a pint of warm water with a squeeze of fresh lemon juice (simple but effective), drink a pint of warm water half an hour before each meal and don't drink with meals (if you feel you need to then you are not drinking enough at other times - limit your water intake to one small wine glass with a meal). Drinking whilst eating dilutes your gastric juices and impairs digestion. Chewing is important for everyone but even more so when you need to get maximum nutrition out of each mouthful. If you regularly see large pieces of food in the loo after you have been this is particularly important for you. I invite you to try and chew every mouthful 30 times. You will not need to chew everything that much but notice how quickly you get the urge to swallow. You may find that when you chew thoroughly you end up eating less. Chew evrything until there are no lumps. Don't do busy things like being on the computer or watching TV when you are eating. I call this eating consciously. 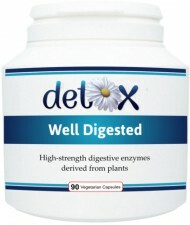 The most convenient and easy way to boost your digestion is with my Well Digested supplement. It contains digestive enzymes together with hydrochloric acid (HCI). You can take just one Well Digested with small meals and two or three with bigger and more complex meals. You will need to experiment a little to find the level that works for you. 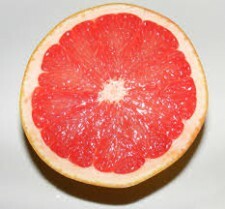 Eat half a grapfruit or a slice of fresh pineapple before meals. They are both great at improving digestion but I suppose the downside is that it not always convenient. Its always best to eat fruit on an empty stomach as it digests so much quicker than other foods and can lead to gas and bloating if its on top of a meal. You can also add some fresh lemon juice to the warm water you are going to drink half an hour before each meal. Or alternatively add a tablespoon of raw organic apple cider vinegar (which has lots of other health benefits too). Everyone who is newly diagnosed as a coeliac or who has not been observing their wheat free diet will have poor bowel bacteria. The medical profession massively under estimate the value of having a digestive tract teaming with probiotic bacteria. Have a look at the section of good bacteria for a broad overview. Some years ago the BBC did a programme, The Truth About Food, on gut bacteria. They got a group of windy cowboys and divided them into two groups. One group ate a diet that was packed with leafy greens and the others were given the probiotic drinks and yoghurts. After two weeks the scientists were able to measure positive improvements in the bowel bacteria of the group eating leafy greens and no change at all for the group using the drinks and yoghurts. So save yourself some cash and eat lots of leafy greens such as cabbage, brussel sprouts, spring greens, rocket, watercress, lettuce etc. It's very easy and I made my own version using finely shredded red cabbage, finely shredded radish, a grated apple, lots of ginger, fresh chilli and some chilli flakes. I can't see how you can go wrong really. My kimchi is best at around the 6 week point when the flavours have really blended together. Fermented foods are partly digested before you eat them and provide lots of good bacteria to start repopulating your gut. You might be thinking something which is called Go Daily is not what you want especially if you have been using the loo rather a lot. Go Daily is however a fantastic product which is beneficial for a wide range of conditions and is particularly useful for coeliacs. Whilst it helps to speed up transit times for those experiencing sluggish bowels it can slow down transit times for those with over active bowels. Go Daily contains psyllium husk which is a very gentle and soothing source of fibre. It is very absorbent and passes through the gut sweeping as it goes: a spring clean for your gut every day. Not only does it contain a maintenance level of a variety of strains of good bacteria: it provides a favourable environment in the gut to support colonisation of the bacteria. Its one thing to introduce the bacteria and another altogether to get them to set up thriving colonies. Go Daily also contains L-Glutamine which is soothing to the gut and also helps to restore and repair gut tissue. its also useful for your brain so all good. More n L-Glutamine next. Personally, I use it in combination with Go Daily and I alternate between Sacharomyces Boulardii and Probiotic Max or Good Bacteria. I recommend that people with coleiac disease take probiotics on a continual basis. There are no downsides and only gains. Be careful when choosing probiotics: all are not equal. My probiotic supplements indicate the amount of live bacteria contained in the supplement one year after manufacture. Most probiotic supplements give the amount of bacteria on the day the supplement was manufactured. After manufacture the bacteria slowly die off so if you buy a supplement that was manufactured 6 months ago it may have only half or less of the amount of bacteria indicated and many will have no live bacteria at all. You can't even judge by the price of the supplement. I have seen tests on some of the premium brands that found they contained no live bacteria at all. It had been believed until fairly recently that the villi in the small intestine would not regrow once they had been damaged however I found some interesting information about a study on this site: http://celiacdisease.about.com/od/DiagnosisFollowUp/f/Celiac-Disease-Villi-Recovery.htm I find it reassuring to discover that lots of people have regrown their villi. It's great news! So I mentioned earlier that studies have found around 2/3rds of people with coeliac disease end up regrowing their villi when they follow a wheat free diet and don't cheat but it seems it takes quite some time. L-Glutamine is an amino acid produced in your body. It is in fact the most common amino acid in your muscles, making up 61% of your skeletal tissue. It is also one of the 20 amino acids encoded by the standard genetic code. It isn’t considered one the “essential” amino acids, but it can become situationally essential in times of intense athletic training or gastrointestinal disease. Several gastro-intestinal conditions respond well to supplementation with L-glutamine. A common ailment of over 40’s is diverticulular disease. With this condition, small pockets form in the gut wall and then fecaliths form and get stuck in the pockets. They eventually harden and ultimately cause inflammation in the pockets causing severe pain. L-Glutamine has been effective in reducing the severity and incidence of this very painful and debilitating ailment. Ulcers and other intestinal issues respond well and its effect on the digestive system are generally beneficial. I think it is worth taking for coeliac disease to support healing of the gut. It is also effective in healing a leaky gut and is increasingly popular in products aimed at coeliacs. It can be expensive but mine is very reasonable and from a natural source (it's fermented from glucose). Also helps to boost the immune system and can prevent muscle wasting in the elderly. I take a couple of teaspoons of L-glutamine powder in warm water last thing at night. In addition to avoiding the gluten grains I recommend that you eat the best diet you possibly can. Your diet should include good quality protein (meat, fish, eggs etc) and lots of vegetables. Aim to eat at least seven porton of veg and fruit every day with more veg than fruit (veg is 4 times more nutritious than fruit). Choose a wide variety of colours and aim to have at least 3 portions of greens plus orange, red, yellow, purple and white veg and fruit. I find using a Nutri Bullet a great way of maximising my beg and fruit intake. The Nutri Bullet liquidises the whole veg and fruit so you get all the fibre with the nutrients. I like to add some fat in the form of either extra virgin coconut oil or Black Seed Oil and I usually also add ginger and turmeric. Make sure you eat oily fish several times a week and also eat some nuts and seeds every day to get additional essential fatty acids. I will qadd to this section as I find useful new information and will also post gluten free recipes and foods as I find them. Long term bowel problems combined with poor bowel bacteria lead to nutritional deficiencies which can cause symptoms themselves. The B group of vitamins are often critically short. When you are in the recovery stage of coeliac disease I recommend supplementing with a good quality multi B. When I first started eating gluten free my diarrhoea did not clear up straight away but as soon as I had been taking a good multi b for a few days it eventually subsided. I continue to take b vitamins periodically and I recommend Nutrigold.co.uk. They have a gold standard for their very high quality products and they are free from additives which will cause you problems. I first started having colonics as part of my programme to restore my health after I was diagnosed with coleiac disease. Colonic Irrigation will help you to restore the balance to your bowel bacteria by assisting in the removal of bad and pathogenic bacteria clearing the way to add health boositng good bacteria. I found it so useful I decided to train as a colon hydrotherapist and continue to have regular sessions. if you would like to discuss any of the issues in this information or to find our more about colonic irrigation please feel free to contact me. I am always happy to help fellow coeliacs and have lots of valuable information and experience to share.